Wireless video transmitter for long range transmission - 1.2GHz. This light-weighted wireless	microwave transmitter enables you to send video between locations where hardwiring is difficult or impracticable. Applications include sending FPV camera video to the receiver on the ground, sending video between buildings across the road and so forth. Video only, no audio. If you need video as well as audio, please visit this page. The transmitter operates on microwave radio system - no internet connection required, no bandwidth to worry about. It is therefore particularly useful in those remote locations where there is no internet/network coverage or out of WiFi range. See a typical setup example here. The transmitter is small, light-weighted and can be powered by a 12V battery pack for a couple of hours. Suitable for portable or FPV drone applications. Compatible with most video cameras with RCA or BNC AV outputs (NTSC and PAL auto detect). Transmission range: Range may vary substantially depending on the actual operating environment. Up to 330 meters (1,000 feet) open space with high gain omni-directional antennas of 12dBi or higher. Longer distance up to 5 km (3 miles) can be achieved if high gain directional antennas are installed in a line of sight environment. Wireless signal can travel through some obstructions such as wall, partition, tree and so forth but in this case, the transmission distance will be reduced depending on the type, materials and the number of the obstructions in the transmission range. Viewing live video feed over the internet or mobile phone. If you have a DVR and other equipment connecting to the internet, you may connect the wireless receiver to one of the video inputs of your DVR so that you can view the camera footage live in a remote location over the internet or on your cell phone. See a typical setup here. 5) Send video from a camcorder to a nearby monitor or DVR. 6) Send video from a FPV drone back to the ground. Number of channel 4 channels. Selectable by switch. Transmission distance Distance may vary substantially depending on the actual operating environment. Much longer range can be achieved in aerial applications. Line of sight transmission range up to 1,000 feet (300 meters) with high gain omni-directional antennas of 12dBi gain or higher, or 5 km (3 miles) with Yagi or other high gain directional antennas. 1) If the transmission path is line of sight, the transmission/reception will be significantly improved by using directional antenna such as Yagi antennas, panel antennas or other directional antennas. 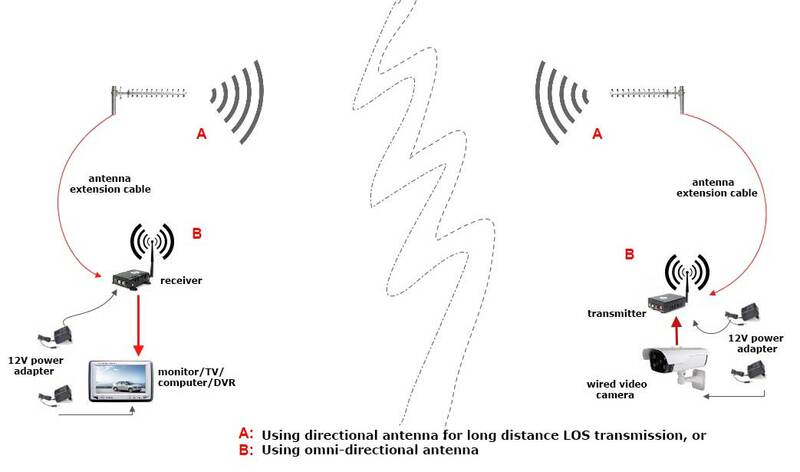 2) Directional antennas are used only if the distance between the transmitter and the receiver is line of sight. 3) If it is necessary to use antenna extension cable, the cable should be kept as short as possible because, the signal attenuates directly proportional to the length of the cable, i.e. the longer the cable, the weaker the signal from the antenna. Alternatively, you may extend the distance between the transmitter/camera or the receiver/monitor by using high grade 75 ohm coaxial video cable such as RG6 cable. See an illustration here. 1) 4-channel 1.2GHz video transmitter. 2) 4-channel 1.2GHz AV receiver. 3) Two 6dBi omni-directional antennas. 5) One RCA AV cable for the receiver. 6) One composite RCA video/12VDC power cable. Please also select the connector type for the cable. If you are not sure what connector type, leave it blank. Tell us in the Message Section on the next page that appear after clicking "Add to cart", what you plan to connect the cable to, on the transmitter or the receiver?